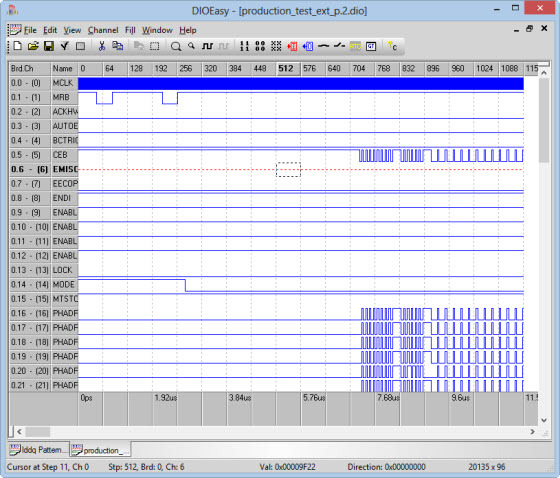 Digital I/O Vector Development Software - DIOEasy | Marvin Test Solutions, Inc.
DIOEasy offers test engineers an efficient tool for developing, debugging, and executing digital test vectors for Marvin Test Solutions' GX5050 series, GX5150 series, GX5280 series and GX5291, GX5292, GX5293 and GX5295 dynamic digital instruments. Digital I/O (DIO) systems are very complex and typically require a substantial amount of programming effort to define data vectors. In order to simplify vector development, Marvin Test Solutions developed Windows-based DIOEasy, providing users with an easy to use interface. Toolbars and menus provide quick access to vector editing and viewing tools. Vectors can be loaded to and from DIO instrument(s) using the DIO Virtual Panel. After loading the vectors, the user can arm and trigger the instrument for generation / acquisition. Data captured from the boards can be saved to a file and/or loaded to DIOEasy for viewing or for comparison against a previously defined vector data file. Setup / configure a digital instrument, i.e. set frequency, trigger mode, etc.